I love cheesy biscuits. They remind me somewhat of Cheddar Bay biscuits at Red Lobster. Not quite the same, but it’s getting there. I love serving them with lasagna or spaghetti. Maybe even some seafood. If you are serving Mexican, add a bit of cumin or chili powder to give it a little different taste. You will need to baking sheet to bake the biscuits. You will need a biscuit cutter. A pastry brush is helpful here. In a medium bowl, add the flour, baking powder, and salt. Stir to combine. With a fork or pastry cutter, cut in the butter til dough is crumbly. Pour the milk into the center of the mixture and stir, just until moistened. Turn out onto floured counter and knead about 10 times-just til dough comes together. With your hands or a rolling pin,pat or roll the dough until it is about 1/2″ thick. With a biscuit cutter or cookie cutter cut out the dough. You will have 8-10 biscuits depending on the size of the cut out biscuits and how thick you rolled them. Put the biscuits on the baking sheet and bake for 10-12 minutes. The biscuits will be golden and when lightly touched, they will spring back. 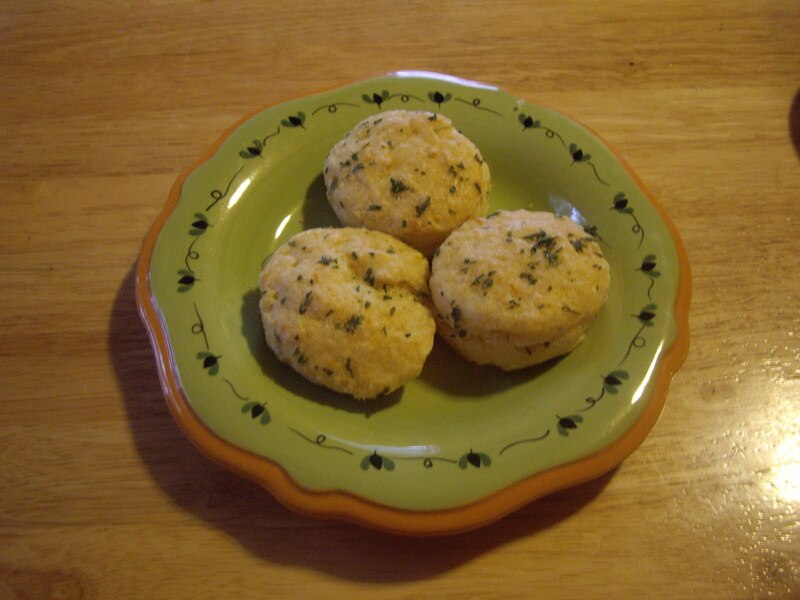 While the biscuits are baking, melt the 6 Tablespoons butter and mix in the garlic powder and parsley flakes. After removing biscuits from the oven, brush the garlic/butter mixture over the biscuits. Use all the butter up. The biscuits will soak it in. These are also great with a chopped hot pepper thrown in with the cheese. Oh, I love this stuff. The picture shows the cheese in it’s melting phase, just out of the oven. You need a greased 9″ square pan, either with a cover or foil for covering. 1 pound fresh or frozen broccoli- You may want to partially cook it so when finished the broccoli in the dish isn’t too crunchy. 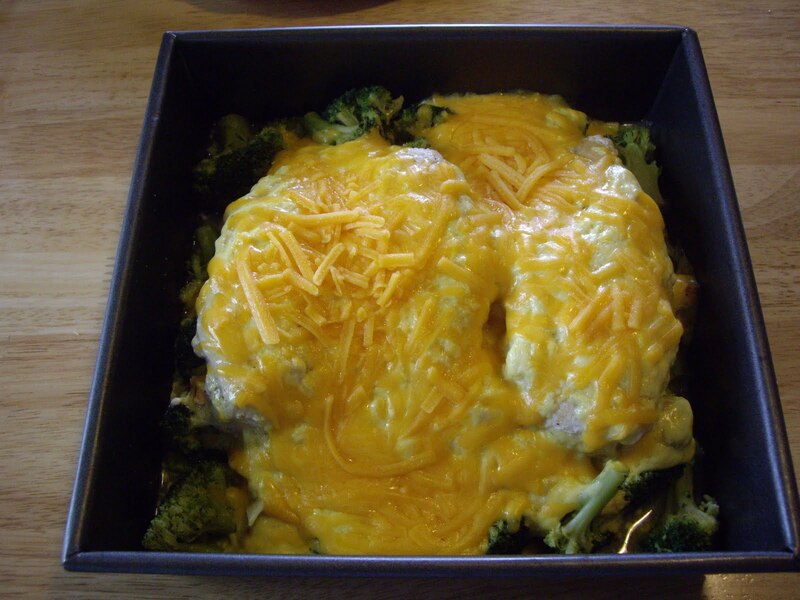 Place the partially cooked broccoli in the greased baking pan. In a skillet, brown the chicken breasts in the oil. Season both sides of the chicken with salt and pepper and lay over the broccoli. In a bowl; mix the soup,mayonnaise, lemon juice, and curry powder. Cover and bake for 40 minutes until the chicken is tender and cooked through. If you like asparagus, try making it with that as well.